It’s easy to spot the signs of a new year: a renewed gym membership, a fresh budget spreadsheet shared with your spouse, or a silent promise to spend more time with family. We all have things in our lives we want to do better (or stop doing entirely), and the start of 2014 is a great time to think about what those things might be. To that end, we asked you — our customers, colleagues and friends — to share your work resolutions for the year ahead. Amtrak resolves to hire more veterans, since their leadership, reliability and high-tech skills make them well suited to run America’s railroad. Techstars wants to focus on always giving first. 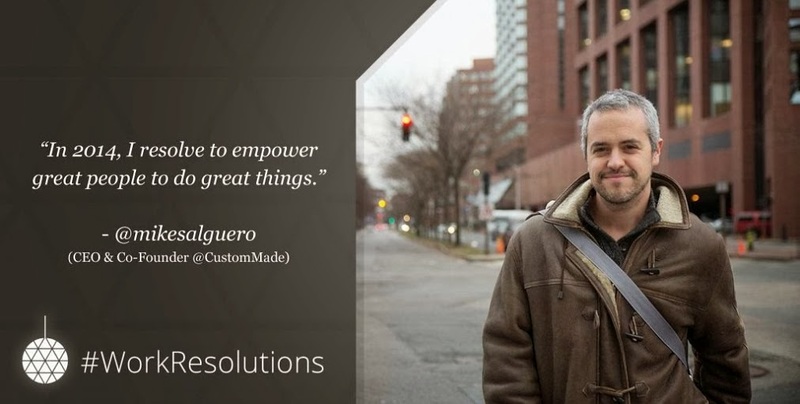 And CustomMade is going to empower great people to do great things. The common theme was a desire to create business NOT as usual, bringing more enjoyment and fulfillment to work. And if you work the way you live, your work goals should matter just as much as your personal goals. In case you’re wondering what my own resolutions are, well, here you go: send less email, choose face-to-face work conversations; house-train the new family dog; and pick up my guitar at least once a week (I’ll save “playing it” for next year). Here’s to a happy and healthy 2014. Let’s help each other accomplish great things!